The Department of Home Affairs has finally launched its pilot project to roll-out smart IDs with the banks. 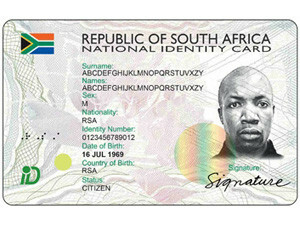 Following the initial announcement in February, the Department of Home Affairs' (DHA) pilot project to allow South Africans to apply for a smart ID card at a bank is finally live. Home affairs minister Malusi Gigaba announced today that Standard Bank and First National Bank will start issuing smart IDs. Initially, the DHA signed a memorandum of understanding with three banks for the pilot project; however, third bank Nedbank was not mentioned as part of the financial institutions handling the smart ID applications. According to Gigaba, making the smart IDs available in the banks provides an alternative channel to serve clients, expands home affairs' footprint, and minimises queues at front-line offices. The partnership with the banks seeks to facilitate efficient and secured ways of accessing services and accelerating the replacement of the green bar-coded ID book, he notes. Previously, the DHA said the pilot phase will run for six months and will be targeted at bank staff, and should the initial phase prove to be successful, it will be extended to the public. In July, Gigaba expressed concerns that his department may miss its target of replacing 38 million traditional IDs with smart ID cards by 2018. The department previously noted it would take between six and eight years before all South Africans have smart ID cards, with the first two years targeting pensioners and people who are receiving their first ID cards. Smart IDs are replacing the traditional barcoded ID book and have enhanced security features, which make them difficult to forge or tamper with. The smart ID card rollout forms part of the DHA's modernisation programme, which aims to provide secure and efficient services to all citizens.